With its smart wood-clad frontage and raised terrace for outdoor dining, The Burger Joint on North Street certainly stands out from some of its neighbours. It was the second branch of Bristol University Dan Bekhradnia’s burger restaurant to open in Bristol – the first starting on Cotham Hill (and subsequently moving to Whiteladies Road), the third now open in Fishponds. Combining quality food, great value for money and fantastic service, it’s not a surprise that the brand is doing so well. The ordering system here is the same as in other Burger Joint branches: each table is given pencils and order sheets, allowing them to tick their choice of burger, toppings, sauces and sides before handing them over (one per customer) to a member of staff. The menu features a huge number of different options to choose from: 11 different burgers alone, plus 19 different toppings, a choice of 21 sauces and 10 different sides. If you were to have a different combination every time you visited you’d be able to enjoy something different for…well, I don’t know how long for, but you’d probably not get through every combination in your lifetime. 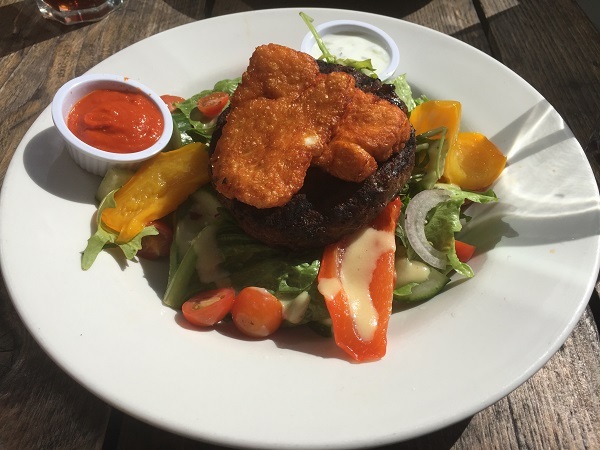 Most of the burgers are priced at £8.50 and include a side, but on this visit, I decided to go for something different and try my first burger salad. Priced at £8.50, it’s a lighter, bun-free option for lunch featuring your choice of patty on top of a generous salad, plus two free sauces of your choice. I chose the Welsh lamb and mint patty: a generously sized burger packed full of flavour and cooked just right with slight crispiness on the outside, and succulent meat in the middle. The salad was plentiful, and the mixed leaves, onion, cherry tomatoes and cucumber were all perfectly fresh and crunchy. The roasted peppers were a lovely addition too, transforming the salad from something relatively standard to something that stood out a bit more, and there was just the right amount of dressing. I chose to top my patty with two slices of halloumi (80p), which were well worth the money. Battered, fried until golden and with a beautiful texture, the saltiness still shone through and worked perfectly with the lamb. On the sauce front, the little pots of creamy tzatziki and and less-hot-than-expected chilli sauce were more than generous enough for dunking both burger and halloumi. I’ve never had a bad meal from The Burger Joint – service is always friendly and efficient, the food is always fantastic (partly due to the cooking, partly due to their great suppliers) and I know – unlike some burger restaurants – that I can leave having tried something completely different to the last time after every visit. Definitely recommended. Glad you love it too – a true Bristol institution!